Austria is a country rich with history, beautiful places, traditions and activities that are distinct to the area. Along with neighboring Switzerland, it is the winter sports capital of Europe. 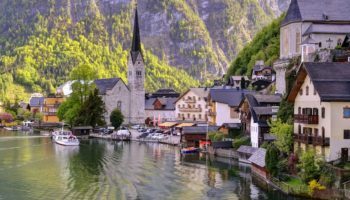 However, Austria is just as popular for summer tourists who visit its historic cities and villages and hike in the magnificent scenery of the Alps. 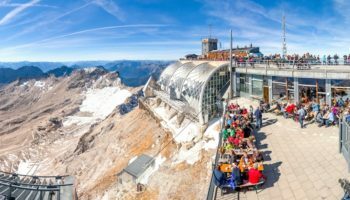 In order to help guide you in building a trip itinerary, below are some of the top tourist attractions in Austria that are sure to make your trip extra special. The medieval Hochosterwitz Castle is said to be the inspiration behind Sleeping Beauty’s Castle, and it is easy to see why. The castle boasts 14 gates, each designed to protect the castle and its inhabitants. An incredible inclined railway brings visitors to the castle, which is also home to a church designed using marble and boasting an abundance of sculptures. The armory, featuring an array of 14th century weapons, is still open to the public. Located west of Vienna, the historic city of Krems marks the point where the blue Danube and the Krems rivers converge at the beginning of the Wachau Valley. Krems boasts a historic city center, and the pedestrian friendly layout encourages exploring the ancient city gates and the castle called Gozzoburg. Krems has a reputation for its impressive wine industry, and many visitors come to explore exactly that. The Weinstadmuseum is a wine-focused museum in the center of town, and there travelers can get great recommendations for local wineries and tasting rooms dotted throughout Krems and along the banks of the Danube. Eisriesenwelt could easily be described as an amusement park for nature lovers. Home to a complex of underground ice caves, Eisriesenwelt offers dozens of miles of paths through stunning caverns. After climbing down more than 700 steps, the Eispalast emerges. This is an enormous palace made from ice, and when light hits its walls it sparkles beautifully. The nearest city to Eisriesenwelt is Werfen, where visitors can catch a round-trip shuttle that departs regularly from the city’s train station. 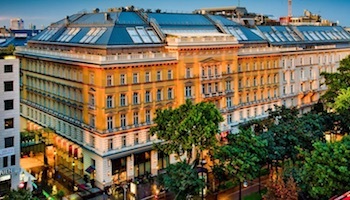 In Vienna’s inner city is the Ringstraße, or Ring Road, along which countless landmarks are found. Just one of these landmarks is the Vienna State Opera House. The structure itself was constructed in the 19th century in a Neo-Renaissance style. Marble staircases and painted ceilings make this is a truly grand destination. After bombing in World War II, the structure was rebuilt to be true to the original style. While a tour of the building is wonderful, what is even better is attending a musical performance or even a ball, many of which are held annually at the Vienna State Opera. The Mirabell Palace in Salzburg, known to the locals as Schloss Mirabell, is a beautiful early 16th century structure built by Prince-Archbishop Wolf Dietrich for his mistress. Considerable renovations in the 17th century mean that the palace now boasts a baroque interior with countless embellishments. The interior is laden with marble, stuccoes and enormous frescoes on the walls. The Marble Hall is noteworthy for being among the most picturesque wedding spots in the city. Outside, the gardens are every bit as impressive, and the sculpture collection is world-class. In the heart of the Salzkammergut Mountains is one peak called Schafberg. This mountain is part of the Limestone Alps, and it boasts a truly incredible view overlooking the Wolfgangsee Lake. What makes Schafberg a top destination is that it is easily accessible with a steam railway. Known as the Schafbergbahn, this train chugs from the town of St Wolfgang all the way to the mountain’s summit. Featured in the Sound of Music, the railway is an iconic attraction that shouldn’t be missed. The medieval Hohenwerfen Castle is perched on a craggy outcropping that overlooks the Salzachtal Valley, but the landscape views come second to the incredible castle itself. The castle is a way to truly get to know medieval life, and the falconry in particular is a big draw for travelers. The belfry offers picturesque vistas and fresh air, while the opposite is found in the dungeons. The dungeons still contain original instruments and are a macabre but fascinating part of the castle. Arguably one of the most popular Alpine destinations in the country is Zell am See. Zeller See, the lake around which the city city exists, is blue, clear and the picture-perfect example of an Alpine lake. 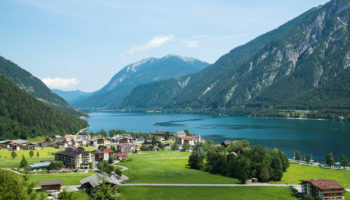 The snow-capped Hohe Tauern mountains peek out in the background, and outdoor recreation like skiing, fishing and cycling are all readily available. Landmarks like the 16th century Castle Rosenberg are the historical cherry on the sundae for this breathtaking destination. Melk Abbey is one of the most famous monasteries in the world. Situated high up on cliff, overlooking the calming waters of the Danube river, rests the peaceful Benedictine abbey. Previously the castle of Leopold II, the structure was given to the monks, who transformed it into a place of tranquility and learning in 1089. The impressive spiritual center has become one of the greatest examples of Baroque architecture and the flourishing musical and liberal arts of its time. 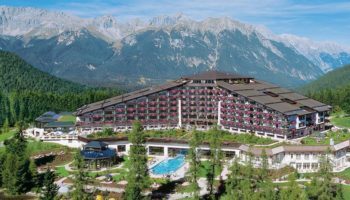 Two time home to the Winter Olympics, Seefeld is an important cross-country skiing center with terrain that is compatible for beginner and intermediate skiers. Located on a spectacular nature reserve, it is the perfect spot, not only for cold-weather sports, but for warm-weather strolls and hiking. Offering the most luxuriously upscale accommodation, Seefeld is your relaxing resort getaway. This magnificent Salzburg castle is one of largest and most well-preserved medieval castles in Europe. Strategically located at the top of Festungsberg mountain, the mighty fortress towers over the city of Salzburg, breathing life into its magnificent skyline. 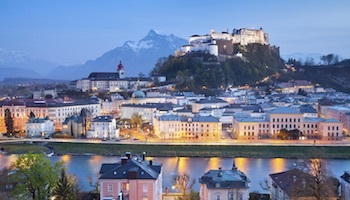 This castle houses the “Salzburg Bull”, an organ with more than two hundred pipes. A truly stunning piece of medieval architecture, representative of the heart of Salzburg, Hohensalzburg Castle is one of the top tourist attractions in Austria. One of Vienna’s most stunning attractions is the Hofburg Imperial Palace. This is a complex that served as the official royal residence of the Habsburgs until the First World War. The palace was built in stages, adding on places like the stables, the library and the Spanish Riding School as power and money accumulated for the Habsburgs. From the entrance in the Michaelerplatz, visitors can tour several onsite museums and even get a look at former royal apartments as well as the glittering Imperial Silver Collection. Surrounded by snowcapped mountains, Innsbruck makes you feel quite insignificant in the midst of nature’s striking Alpine mountain range. Said to have a duel personality, the area offers both pristine landscapes and a sophisticated urban center. 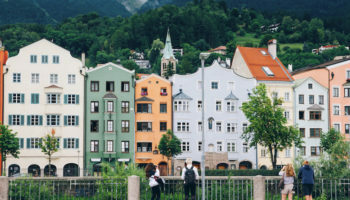 Altstadt, the medieval town of Innsbruck, draws you in with its unique architecture and many shops. While you are strolling the streets of the Altstadt you can visit one of its famous landmark, the Golden Roof. This house was constructed for the Holy Roman Emperor, Maximilian I, and it was decorated with thousands of gilded copper tiles that create the appearance of pure gold. Another famous ski resort area worth visiting in Austria is called St Anton am Arlberg. Located in Tyrol, this village offers serious, legendary ski terrain for those who are seeking a challenge. Often attracting adventurous youths, St Anton is notorious for living up to the saying “work hard, play hard”. The vast landscape welcomes its loyal winter crowd, as well as its summer mountaineers, who come to trek the landscape each year. If you are looking for a good time, St Anton is the place to be. Grossglockner Alpine Road is a panoramic road which takes you up to the Kaiser Franz Josefs Höhe Visitor Center. From there, you get the unobstructed view of Austria’s highest mountain, the Grossglockner. 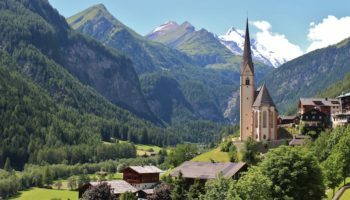 The Grossglockner Alpine Road is a toll road, but the fabulous high alpine scenery more than makes up for the expenses. The road is normally open from the beginning of May to the end of October. Another great tourist spot is Hallstatt, a small village in the Salzkammergut region, famous for its salt production. As salt has long been a desired commodity used to preserve and provide flavor to food, the village has a long-standing history of wealth and prestige. The wealth accumulated from the salt industry transformed it into a glamorous baroque village. Visit Hörnerwerk cavern’s subterranean salt lake and see the prehistoric man preserved in salt. Truly one of the most unique places in Austria, you must experience Hallstatt. Last on the list is Schönbrunn Palace, one of the major tourist attractions in Vienna. Comparable in grandeur to Versailles, this 1,441 room palace was built between 1696 and 1712 at the request of Emperor Leopold I and turned into the imperial summer palace by Maria Theresa. The Palace Park offers a lot of attractions, such as the Privy Garden, the oldest zoo in the world, a maze and labyrinth, and a marble summerhouse situated on top of a 60 meter high hill. Which attractions in Austria do you consider to be the most interesting? 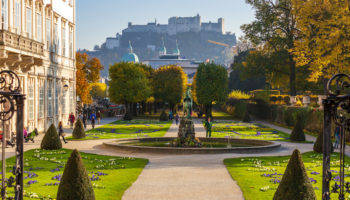 I am planning a trip to Austria and wish to see all the 10 destinations mentioned on the site, however I am unable to decide the road route and places where I need to book hotels in order to be a able to see all these attractions. I will be with my family (spouse and 1 kid) and intend to drive around Austria, can you help me with that. Hi planning a trip to Austria in July 2014 can you help me with a road map and recommended accommodation thank you. Hi anupama. It is possible but not very practical. The closest one is Budapest which is more or less OK to do. Then Salzburg is a bit of a stretch and Prague as a daily trip I would not recommend. Hi… I am planning a trip in March 2015 second half.. Could someone recommend a route? I will be starting and ending the trip in Vienna with my mother. We would like to travel by train. Hi, I am living in vienna. If you like to do it by train – thats a pretty good idea. You can visit all places very convenient by train and its not very expensive at all. I would highly recommend to take your time in Vienna, there are a lot of things to explore – depends on what you are interested in. And you dont need a car at all! You should definitely go to Salzburg and visit the castle there, also a short walk through the old town is very nice. 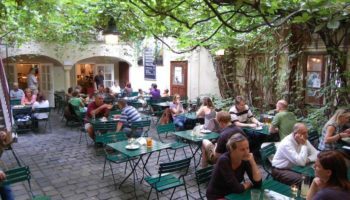 you can get a lot of good food there after that you should catch a train to Hallstadt – its also mentioned on this site. Then you can go to Innsbruck. Its a wonderful town between mountains. Hi. We are a family of 6, we are planning a trip in the second week in Dec 2016. After reading some comments, we are contemplating whether we should proceed with the plan to Austria during that time of the year since some of the places will be closed. It would be great if someone could enlighten us on our doubt. We have wished to visit Austria for time, just couldn’t choose other period of the year to travel due to kids’ school schedule and work commitment. Just returned from Austria mid March,2016,and visited many of the top 10 places to see.Some were closed because they were still in winter mode and the flower beds were just being worked on and the trees around the summer castle of Marie Theresa were still wrapped and covered which took away from the grounds ..so in Dec it would be the same..having said that,Austria is a beautiful welcoming country,friendly ,safe and very ,very clean.I would go anytime of year.If you and your family are skiers,then this is the place to be..especially anywhere near Innsbruck..the scenery is breathtaking. Certainly would add the Salzkammergut as a region with the Sound-Of-Music attractions in Salzburg and Mondsee. 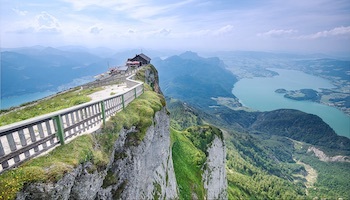 Moreover, the Schafberg mountain offers spectacular views of the lake area.